My experience was quick and painless. Called at the last minute asked for what we wanted and it was reserved. Could not have been any easier. Thank you! Our stay at Summerwinds was too short. Loved the unit and the property. 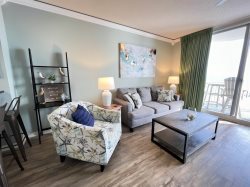 The unit was very spacious, clean and a wonderful view of the Gulf of Mexico. Most definitely will stay at Summerwinds again. If I had to make a negative comment it would be on me that we did not stay long enough! The team left a good impression. Everything went well. It was an excellent start to a vacation that covered 3 states. We had never stayed on the gulf coast. We saw lots of sea life and great sunsets during early evening walks on the pier, followed by drinks and food at the bar while listening to music. Late October is a great time to be there because the weather is still nice with not as many people. We stay at this property because of the members of your team. Everyone that we have dealt with are kind and offer there assistance with anything that we need. We will continue to return back to this property each year. The condo was great. It had everything you would need in the condo. The owners even gave us a gift card to eat at one of the restaurants there in Navarra. Loved the Bay in the front of the condo and the Ocean in the back. The only draw back to the condo was is that the bedroom window is next to the elevator and you can hear it being used when you are trying to go to sleep. I would not call that a deal breaker though. We look forward to visiting there again soon. Friendly, efficicient, and very helpful! Great location and very nice property. Everyone was polite, efficient and responsive to needs/request. My only suggestion is there was not enough towels for a 3 bedroom condo. The only thing this year was one of the elevator was closed and being worked out so we had to wait longer, and one of the pools was closed due to painting, and one of the hot tubs only had cold water. It was very busy this year and usually I could get in pool without alot of people, but it was busy with just two pools. It is a beautiful place and we will be back every year and we will tell others to stay there. It is clean, friendly and right price.Thank you for all you do for us and the beach.